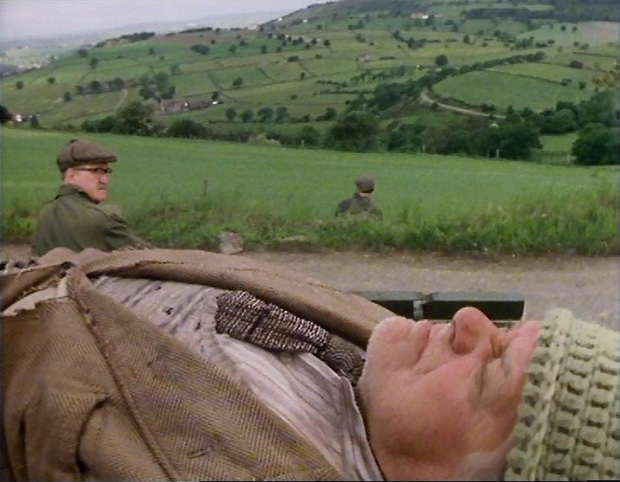 Andrew: So, this episode opens with Bill Owen flat on his back, viewed from the waist up, and moaning… with boredom, we thankfully find out a short time later! Actually, one thing that strikes me here is how much Owen seems to have aged into his part. I know it’s only been five years or so, but he no longers strikes me as prematurely retired. It may just be good makeup and costume, but he seems a bit thinner and greyer… and look at those bags under his eyes! Bob: I’m increasingly the same. I know that boredom is a driving force behind the main Summer Wine characters, and the show is essentially about their relentless quest to fill the days, but it’s rare that we see it addressed so directly as in these opening scenes. They’re genuinely depressed at the lack of excitement in their lives. ‘Be fair, we had a war in 1939, and it’s not ten years since you had your appendix out’ muses Clegg, glumly, to a downbeat Compo. Andrew: There’s an unseen adventure I wish we had been privy to. Compo let loose on a hospital ward! Bob: Even Foggy seems unusually ground-down and lacking in inspiration, and decides to count his blessings out loud… with an embarrassed, stultifying silence the predictable result. I do wonder if Roy Clarke had a stock of opening sequences that he wrote without assigning them to any particular episode? So many of these stories start with lovely, rambling dialogue between the three leads that has no connection to anything that follows! Andrew: This feels very much like a throwback to the first two series, with our trio just wiling away the hours. There’s no real set piece to speak of. 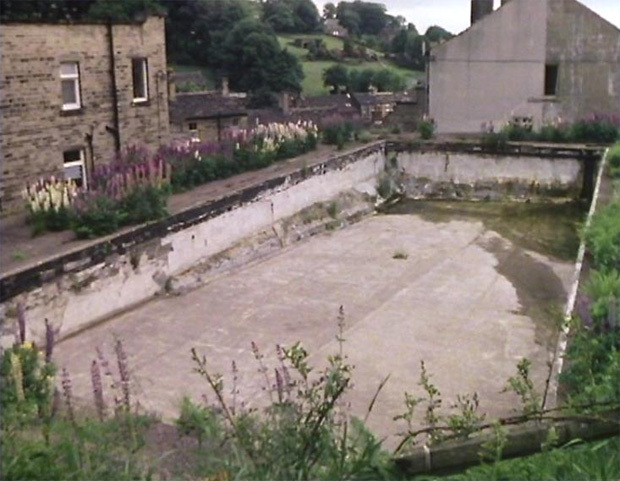 Bob: We haven’t touched on the inexorable march of time for a while in Summer Wine, so the scene in which our trio attempt to go swimming (complete with rolled-up towels beneath their arms) is a nice reminder of the show’s roots, and the Blamire era’s recurring theme of progress leaving our heroes behind. The swimming pool, when they arrive, is closed and has clearly been derelict for some time. Time has marched on, and the kids in 1979 are playing with Star Wars figures and Space Invaders instead. ‘You look like three mobile gravestones,’ comments Sid, when he sees how downcast this makes them. As I race towards my 40th birthday, I can empathise completely with this – life just moves too fast for me sometimes, and I want to wallow in the simplicity of a bygone age. Andrew: When you talk like that, I feel like an enabler. ‘Three mobile gravestones’ actually sounds like something that the series’ critics would cruelly label the show in later years. Bob: There’s some staggering anti-Yorkshire dialogue in the pub, but I think this is Roy Clarke having his ‘Jewish stand-up’ moment! He can do it, but anyone from outside God’s Own Country better not even think about it. Yorkshiremen are ‘a smug invention’ claims Foggy, who ‘think Jerusalem is somewhere between Leeds and Bradford’. Meanwhile, Clegg is musing that ‘they make better beer down South’ – which seems incredibly out-of-character for someone who has previously turned white at the prospect of crossing the county’s borders! Had Roy Clarke had a run-in with a brewer from Todmorden, or something? The 1970s was a very Yorkshire decade, mind. Leeds United winning the league title, All Creatures Great and Small, Harvey Smith and Fred Trueman. Even Middlesbrough was officially in Yorkshire until 1974, so I suppose I’m a Yorkshireman by default. Although by nature, of course, I’m a child of the universe. No less than the trees and the stars, I have a right to be here. Andrew: I think Foggy might be joining you in your mid-life crisis for this episode; or a mid-late-life crisis in his case. Challenging the idea that Yorkshire is not the centre of the universe is quite a big step, really. That’s sort of this series entire POV, isn’t it? Bob: Until now! And so Foggy creates the idea of Earnshaw, ‘The Yorkshire God’. Clegg and Compo buy into it wholeheartedly, and spend a sizeable chunk of the episode concocting complex methods of worship, avoiding the cracks in the paving stones (something I became oddly fascinated with in 1979 as well, although I had the excuse of being six). Andrew: In this critique of God’s handiwork, I can’t help but think this is Clarke’s agnosticism at play again, or a least his disillusionment with the rituals and peculiarities of organized religion. I really need to dig out the Holmfirth episode of Songs of Praise, as I’m sure he was interviewed about his beliefs during that. Bob: And we get a slapstick-ridden cameo from David Ryall… here stranded beneath a car, but in 2012 appearing regularly as the Grandad in Outnumbered! It took me a while to recognize him as a forty-year-old rather than a bloke in his mid-seventies. Tempus fugit Robert, tempus fugit. Andrew: Ryall faces the full force of our trio endeavouring to be helpful… and comes out all the worse for it. It’s funny, broad stuff, but is this the stupidest Foggy has ever been? His bluster has been rained in by the odd tumble here and there in the past, but here he’s suddenly transformed into Mr Bean with a Some Mothers Do ‘Ave ‘Em finish. I’m not sure the comedy is worth undermining the character in this instance. Bob: Some nice dialogue and ideas in this episode, but it doesn’t quite hang together for me. It feels like a series of sketches all sandwiched together. Andrew: I’d rather it be aimless and funny than convoluted and padded, though (I’m looking at you, Flag and Its Snag). Bob: Although I do like the concluding thought that, every week, Compo rotates the services he has cut off… gas one week, electricity the next! Very funny. This is one of our favorites. You are so right, it was very funny about Compo rotating service cut offs. Being from the States and knowing that the show is a caricature of the real Yorkshireman, they make the area very appealing to visit. We get to see 8 shows a week on PBS plus we own all the available DVD’s. We look forward to more DVD’s being put out. Thanks for this wonderful blog! It’s an intriguing tale, from the “count your blessings” opening (I like that they all criticise the sky, rather than split off into groups), to the “chips with everything” gag at Compo’s place, and the set-up for later with Wally’s knocking. “It can be very tiresome just eating buns”; “Do something funny – pay for something”; “and what about the old bubonic plague?” A nothing scene full of laughs. 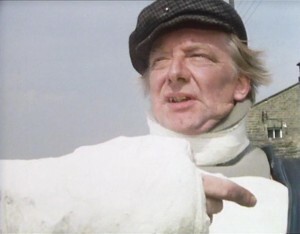 The David Ryall scene is an odd diversion, or an omen for a future with a greater mechanical tinkerer… why would someone with that kind of plaster still be desperate enough to work on a car engine? And so to the finale, where Nora rushes past Compo’s cluttered front window, where a steel bath is clearly visibly to all, at all times, but is never once taken despite its rare relevance to the plot.